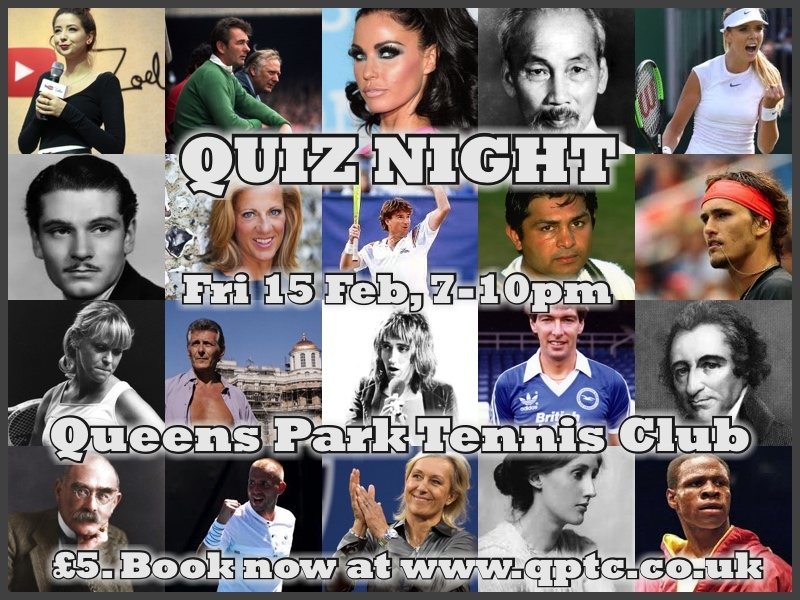 Join us for Quiz Night at QPTC on Friday 15 February, 7pm for a 7.30pm start. Entry is £5, including snacks. There will be a bar, and all profits from the event going to the club. There will be four people (max) per team, and we expect a maximum of 10 teams. Please email event organiser Charlie Baines to book your team, or you can put your names on the sheet in the clubhouse noticeboard. Taster: “It’s the hard that makes it great” – who says this line, and in which movie? Teaser: In 2006, Andy Murray defeated Lleyton Hewitt to claim his first ATP title: where was it? Follow Queens Park Tennis Club on Facebook and Twitter for latest updates, news, photos and funnies. And we’re queensparktennis on Instagram.